An all-out trade war would severely damage the U.S. and Chinese economies but could also be a boon to countries like Canada and Mexico, the International Monetary Fund said Wednesday. The world’s top two economies themselves would be the biggest losers in the event of a 25 percent hike in duties on all trade in goods, the IMF said in a report released ahead of next week’s spring meetings, to be held jointly with the World Bank. Bilateral U.S.-China trade could fall by up to 30 percent in the short-term as a result and by as much as 70 percent later on — taking sizable chunks out of both countries’ economies. The 2019 spring meetings fall just as U.S. and Chinese officials say they are in the home-stretch of negotiations to resolve their eight-month trade war, in which Beijing has put tariffs on all its U.S. merchandise imports while Washington has slapped duties on about half of its Chinese imports — more than $360 billion in two-way goods trade. Citing success in the talks, U.S. President Donald Trump has suspended plans to raise duties on a $200 billion tranche of Chinese goods to 25 percent, keeping them at the current 10 percent. According to a range of models cited by the report, the hypothesis showed annual growth in China could be 1.5 percent lower, while such a scenario could shave as much as 0.6 percent off growth in the United States. “The effect on China is typically larger across all models, as exports to the United States represent a larger share of the Chinese economy (than vice versa),” the report said. Under the scenario explored by the IMF, Canada and Mexico could ultimately benefit as they export more to the United States, making up for the shortfall in U.S. imports from China. And according to one model, these shifting export relations among countries would mean that, while the U.S. trade deficit with China would fall somewhat, there would be “no economically significant change” in either country’s overall trade balance. A separate statistical model showed China would ultimately cease to be “the number one exporter of electronics and machinery to the United States,” as Canada, Mexico and other Asian countries picked up the slack. 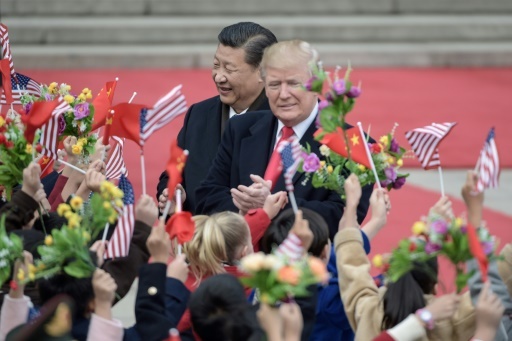 As China continues to emerge as a budding superpower, experts are warning that a broad untangling of the two economies could be inevitable as policymakers in Washington increasingly view Beijing as a threat to American military and economic primacy. “The trade war is not fundamentally about trade at all; rather, it is a manifestation of the escalating strategic competition between the two powers,” Minxin Pei, a professor of government at Claremont McKenna College, argued recently in Project Syndicate.